Most drivers in the world have never driven a hybrid vehicle before. All they know about these hybrid vehicles is that they run on an internal combustion gasoline engine and an electric motor that is battery powered. But few of them know how this combination actually makes the car function. The truth is that drivers get a choice between how much electricity from the electric motor they can use for their driving and the amount of gasoline they get from the internal combustion engine. Normally, a driver would utilize both the engine and the electric motor in order to conserve both the battery power and gasoline. The battery inside of a hybrid vehicle is much larger than your typical conventional car battery. Not only does the hybrid battery have to power the basic accessories like the air conditioner and radio, it also must power some portion of the vehicle’s movement as well. This requires it to be a much more massive battery that costs thousands of dollars and lasts for around 100,000 miles. To understand how a hybrid vehicle works, you basically must understand its internal structure. Below are the 6 main features of its structure. Fuel Tank – You will still have a fuel tank to store your gasoline like in a conventional vehicle. Due to the advanced technology in hybrid cars, the gas won’t need to be used as much. You will have better fuel efficiency and produce fewer emissions as a result. Transmission – Most hybrid vehicles will still use a conventional transmission that you would find in a regular gasoline car. However, there are new transmissions being built specifically for certain hybrid cars, such as the Toyota Prius. 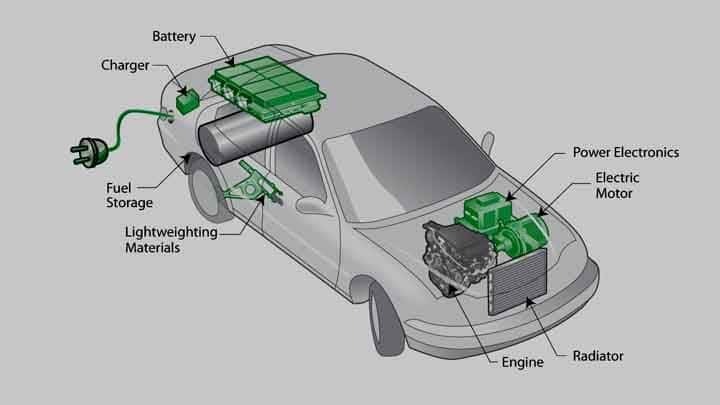 Batteries – The batteries are what power the electric motor of a hybrid car. Not only that, but the batteries can actually take power back from the electric motor too. This is one way their lifespan can be preserved. Generator – If you have a series hybrid vehicle, they have a generator which gets powered by the gasoline engine. From there, the generator can then generate power for the electric motor and help recharge the battery. It is basically a way of converting gasoline into the electrical energy for the motor and battery. Electric Motor – This is the feature that makes the hybrid vehicle particularly special. The electric motor has the ability to accelerate the vehicle by taking power from the battery. However, it can also give power back to the battery if you slow down the vehicle. Gasoline Engine – The hybrid vehicle still has a gasoline engine. This remains to be the main power source of the vehicle since 1 gallon of gasoline has the same energy as half a ton of battery power. Some hybrid vehicles can be plugged in for recharging the battery while others do not have this ability. The plug-in hybrids are considered to be electric vehicles while the ones you can’t plug-in are not electric vehicles. The ones you can plug in will typically have an “electric-only drive” feature which lets you power the movement entirely with the electric motor. The only problem is you can only drive at low speeds of between 10 and 30 miles per hour. The electric motor is not powerful enough to accelerate the vehicle faster without tapping into the gasoline engine for more power. If you try to drive faster than 30 mph while on the “electric-only drive” mode, then you will exhaust your battery power quickly and then be forced to drive on only gasoline like in a normal car. How Do Pedestrian Sensors and Protection Systems in Cars Work?